A brief Walkthrough on how I generate ideas and how these ideas eventually turn into finished works. I normally start in a sketchbook. 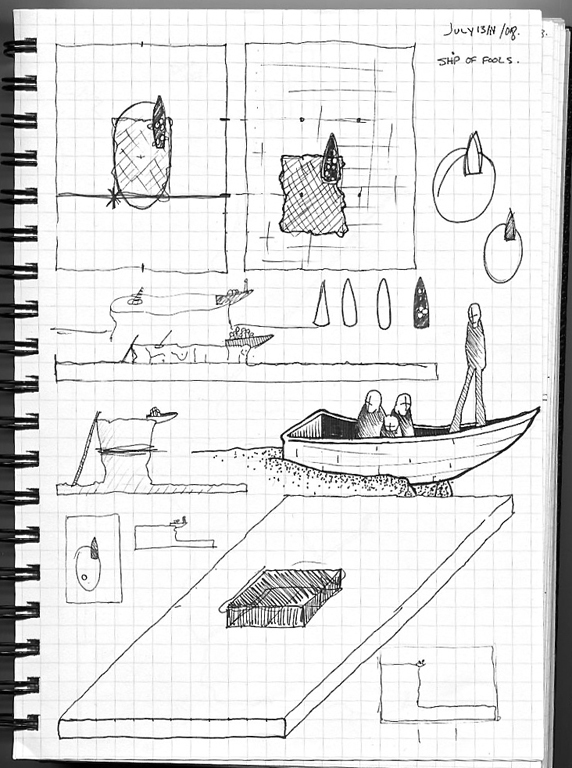 When ideas come, I try to capture them right away even if they are in a very raw or unfinished state. Sometimes an idea can sit dormant for a period of time which is fine if it has been somehow documented through drawings, writing, or both. The same idea resurrected two years later in 2011. I made this sketch after deciding to build the actual piece. I try not to over-develop the piece in the sketchbook. I want to have a enough information to start without wasting a lot of time or materials but I also like to leave room for the piece to evolve as it’s being built. 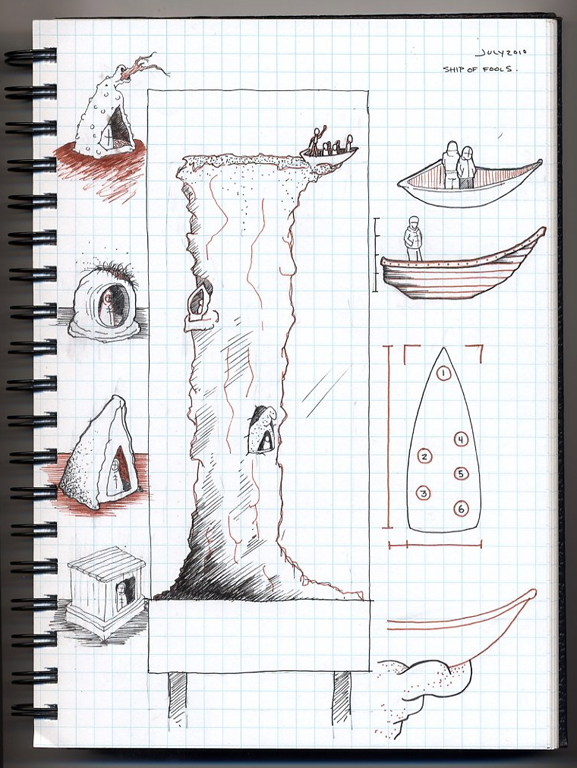 I try to use the sketchbook as a guide, not as a strict blueprint. Once I have a fairly good direction as to where the piece is heading I lay out the basic composition on a flat surface. At this stage I don’t really worry about landforms or major structures. I am really just trying to get an idea of how the major elements are going to be laid out. 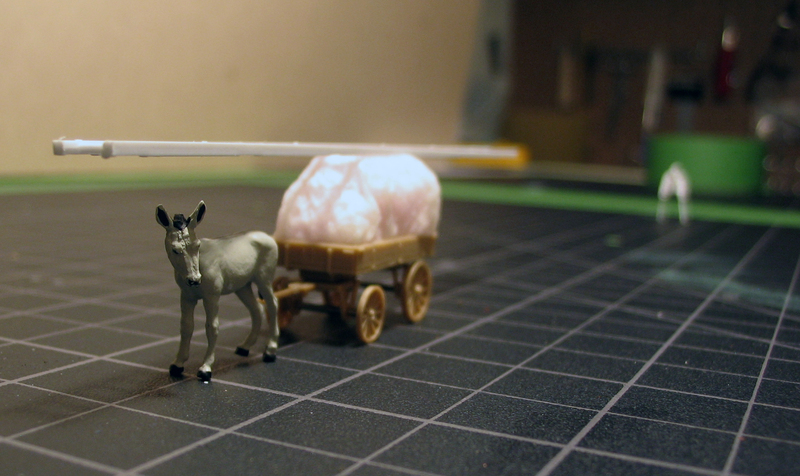 Compositional Layout for the piece “how the miles are marked.” The final composition didn’t change a whole lot except that the ladder was positioned vertically on the ground plane rather than horizontally across the wagon. At this point the process starts to move in a few parallel directions. The landforms, structures, and figures are built separately. 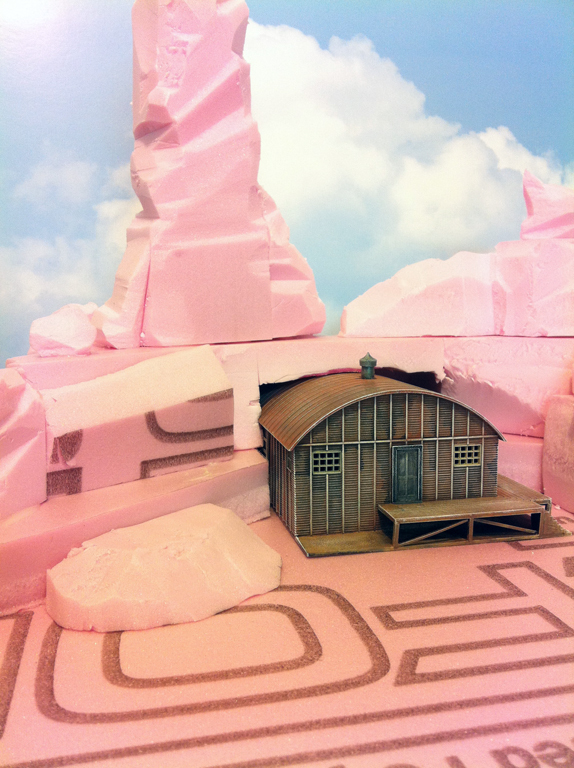 For the landforms I use high-density foam insulation as I find it carves, shapes, and paints quite nicely. Finishing the landforms is usually done with acrylic paint and model landscaping materials. The structures are plastic or plaster kits from HO scale model railroads, tabletop wargaming kits, or built from scratch from resin, plaster, card stock, etc. Again, these are finished with acrylic paint. The figures are all HO scale and are sometimes modified with small amounts of “green stuff” which is a two-part, epoxy-based modeling putty. As the different elements are progressing, I regularly put them together to keep the final composition in mind. In progress photo of “neither the courage nor the faith.” The figure is just a generic person used for scale reference only. In progress shot of “come home to roost.” At this stage the building structure is complete as the landform had to be carved and shaped to fit around it. 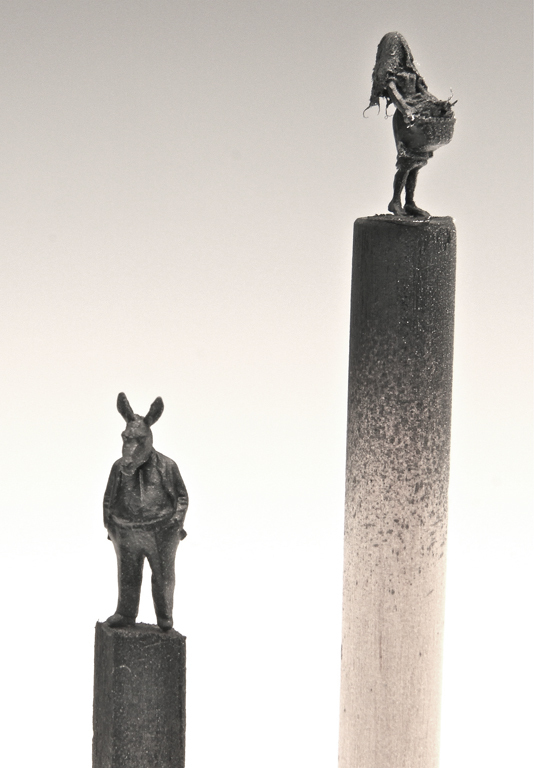 The figures often begin as individual parts on a sprue. Through lots of cutting, scraping, filing, and carefully glueing, the finished figure emerges. Raw HO scale figure parts still on the sprue. After the figures are assembled I use Games Workshop Chaos Black to prime them. Assembled figures, primed and ready for the next stage of painting. 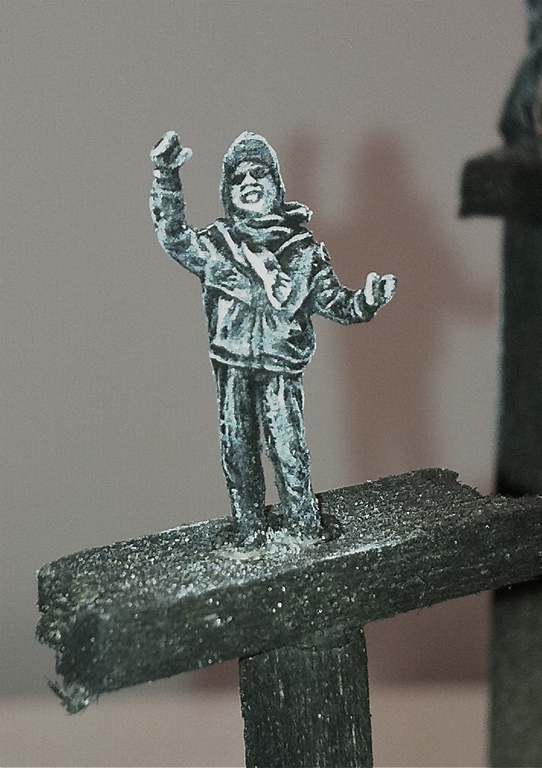 For the next step in painting the figures I like to dry-brush the entire piece with white in order to separate the highlight and shadow areas. The final stage in the figure painting process involves building up color through applying several thin layers of acrylic. 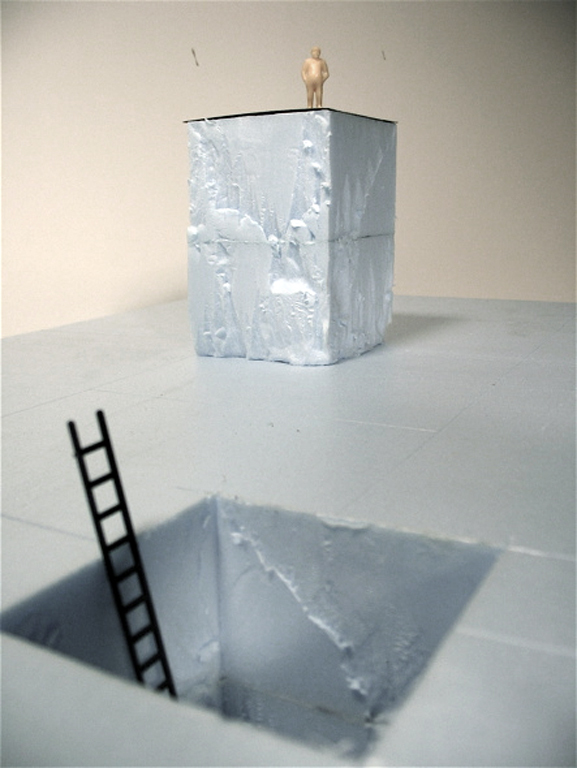 A light dry-brushing on some areas is often done at the end. This figure was built as a stand alone element. He has yet to find a home in a larger piece. Once the piece is finished I try to document it as thoroughly as possible. 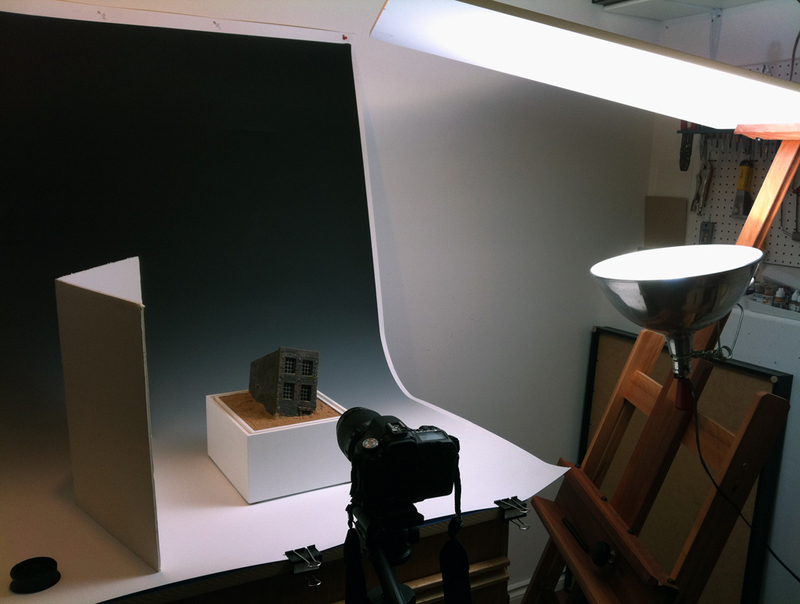 The studio needs to transform from workshop to photo studio from time to time.